watertube boiler to Powerhouse Equipment & Engineering Company, our East Coast Partner, for a sale to a ConocoPhillips LNG plant in Australia. 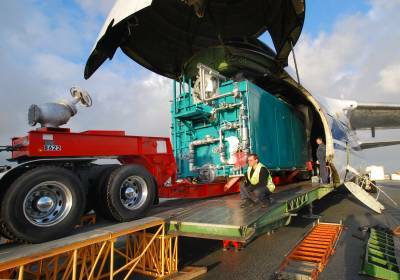 The boiler, along with a new Powerhouse supplied 75,000 pph skid-mounted watertube boiler was airlifted on the Antonov AN124-100 aircraft from San Francisco International airport to Darwin, Australia. It took a total of three days for the boilers to reach their final destination, having to stop for re-fueling in Alaska, Russia and the Philippines. Over the last seven years, the Antonov has also been used to ship our boilers to New Brunswick and the Philippines. Also, five of our boilers have been shipped to Wales, Israel, Venezuela and Malaysia and several of our trailer-mounted watertube boilers have gone to China and Scotland for rental projects (via special transport ship). By air, land, rail and sea, you can depend on Nationwide Boiler to deliver quality equipment and cost effective solutions anywhere in the world. I just finished reading a good book recently published by Ram Charan called Leadership in the Era of Economic Uncertainty. He said "when we think about the CEO's job, it is helpful to divide it into two realms: leadership and operations. This first is about inspiring and motivating people to go beyond their fears and painting a believable future that is waiting after the storm. The second is about the daily nitty-gritty of doing business successfully in a very tough and unpredictable environment." The latter is easier to do - grind it out. The tougher part is to inspire and motivate other when things look real bad. But I believe there is strength in numbers and you don't have to go it alone. Draw in your best people and ask them what they think and will do in this tough economic environment. Our Environmental Solutions Business Unit Vice President, Robert Remkes, has coined a phrase this year, "Boots on the Ground." We are rallying around the idea that we need to be involved with our customers as much as we can. We cannot go it alone without them either and that they may have some of the best ideas yet to be discovered. Hang in there. If you have any ideas or suggestions, please let me know. This blog is one way to communicate with us and I hope you will find it useful. Please let me know. Companies require rental equipment for several reasons. By understanding the rental process and following the guidelines below, it is possible that the result will be both cost-effective and technically successful. Steam Requirements - Up front planning is the most important stage when renting equipment. First, the maximum potential steam load needed must be calculated. Your steam requirement is expressed in either boiler horsepower (hp) or lb/hr (one boiler horsepower is equal to 34.5 lb/hr steam at 212°F). Accessible Location - A location must be selected that is easily accessible for the delivery and setting of heavy machinery and one which has easy access to the building or equipment in which the steam will be required. Utility Connections & Supply - Fuel, water and electric power connections must be easy to access and are of sufficient size to meet the needs of the rental unit. Typically, rental boilers fire natural gas, No. 2 oil, or heated No. 6 fuel. It is also important to make sure that there is sufficient fuel capacity to supply any existing units and a temporary boiler. Equipment Supplier - When evaluating a supplier of rental equipment it is important to know if the company is a full-time, dedicated rental company with the experience, equipment and capabilities you require. In addition, the location of the company's equipment is important, helping to minimize transportation costs and travel time. It is also important to determine if the company provides start-up and installation services. Here at Nationwide, we have boilers located throughout the United States and our service department is available 24 hours a day for technical support. Reputable rental companies will provide complete drawings and equipment specifications in considerable detail. Such items include the total capacity and operating characteristics of the boiler, water treatment needs and requirements, emissions requirements, weather protection, performance testing, and ASME code requirements. Proposal Evaluation - When evaluating a proposal, normal factors including payment terms, change-of-scope clauses, liability coverage, and transportation costs need to be addressed. A well written proposal should address the rate and term on the rental unit, freight costs, time and travel charges for technicians, and should specify appropriate responsibility for installation and removal costs. You should also get the warranty statement for the rental equipment. Operating Permits - Before installation of the equipment can occur, it is necessary to arrange for any operating permits required from regulatory agencies. This includes special permits that may be required in those areas where emission limits are strictly controlled. Areas in California including the San Joaquin Valley and the South Coast require sub-10 ppm NOx requirements. Nationwide Boiler took the lead in equipping our units with Low NOx burners and SCR systems (the CataStak). Users facing 5 ppm NOx can rest assure that we have an immediate solution. Maintenance - To ensure continuous, safe, and trouble free performance of the unit, there are a number of regular checks and maintenance tasks which must be performed. It is important that a log sheet be kept on site for the recording of every routine check and maintenance items completed. Daily checks include an examination of all safety devices, followed by an inspection of the low-water cutoff during every shift. The entire system should also be checked for leaks and corrected immediately. The flame pattern of the burner must also be inspected to make sure the combustion devices are working efficiently. Moreover, proper boiler performance is highly dependent on following the proper feedwater treatment and correct blowdown techniques. Failure to maintain proper water chemistry is a major cause of damage to rental boilers and the single biggest rehabilitation expense. Return Shipment - Lastly, there are certain steps that must be taken to ensure safe return of a unit to the rental company's facility. It is the responsibility of the user to have plant or local boiler shop personnel disconnect equipment after use, which includes draining and flushing all boiler lines with clean water to help minimize any chance of corrosion. A final check of the condition of the boiler should be properly documented, recorded and sent to the rental company once the equipment is shipped. As long as you plan in advance, budget accordingly, verify connection sizes, address permitting issues, properly train operators, frequently monitor the feedwater quality, and take responsibility in maintaining the equipment once it is installed, you can be confident that the risks associated with renting equipment will be minimized and that your project will be a success.